Tired of having the same, boring roti sabji daily in your meals? 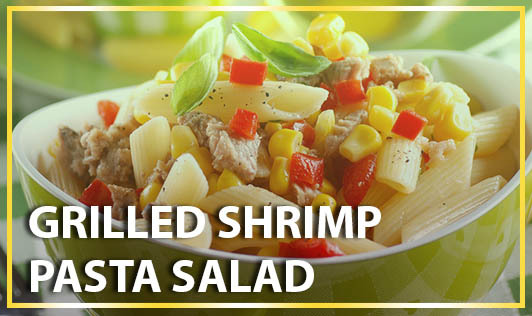 Try this yummy, easy to make, low calorie pasta filled with mouth-watering grilled shrimps and vegetables. • Boil 6 cups of water in a saucepan and cook the pasta in boiling water till aldente. Drain the pasta in a colander, rinse it under running water and keep aside (do not use oil and salt). • Dice onion, red and yellow capsicum. • Brush the vegetables and shrimp lightly with olive oil and grill them on griller or non stick griller for 10 minutes, turning occasionally. • In a non stick pan, heat 1 tablespoon of olive oil and sauté garlic for a few seconds. • Add the grilled shrimps, vegetables, sweet corn and sauté for a few minutes. • Add oregano, black pepper powder, chilli flakes, basil and salt to taste and toss everything together gently. • Lastly, add balsemic vinegar and parmesan cheese and mix well. For a creamy texture, you can whisk ¼ cup of plain yogurt and pour it over the pasta. Vegetarians can use paneer / tofu or boiled soya chunks instead of shrimps. Avoid adding cheese to keep it low calorie. You can also refrigerate the pasta and serve it cold.